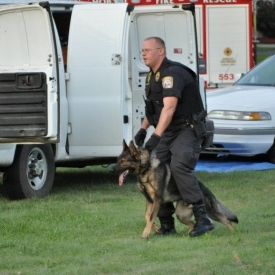 The Hobart Police Department K-9 Unit consists of four teams and is lead by Corporal A. Simon Gresser. The unit certifies every year with the American Police Canine Association. K-9 Butch German Shepard, handler Officer K. Garber Jr. The Hobart Police K-9 Unit strives to educate law enforcement and the community in the aspects of the police patrol detector dog. While using these canines’ natural abilities, we are able to train these dogs for applications that we use in law enforcement. Utilizing such canines in their specialized areas, we are able to preserve life and property and suppress the criminal element. Hobart K-9s are used for tracking, trailing, narcotic detection, evidence recovery, and protection purposes. They frequently conduct demonstrations for community businesses and do routine school searches for many area schools. Our K-9 Unit is a donation based unit and frequently has community fundraising events. For information on events please check the Hobart Police Department's Calendar or like us on Facebook.